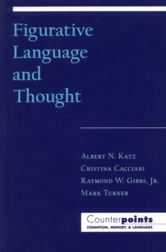 "Turner manages to lead the reader on a delightful romp that begins with a tour of rhetorical figures (antimetabole, ecphonesis, metalepsis, and zeugma, to name a few), and ends with modern developments in cognitive linguistics. For example, he traces the classical definition of figure, as a pairing between linguistic form and conceptual meaning, to its modern day counterpart in construction grammar, a formalism that defines grammatical constructions as devices for pairing phonological form to conveyed meaning. Turner explains that in attempting to account for all of language use, construction grammarians tackle the project that Quintilian set aside when he confined himself to the study of artful figures." - Journal of Pragmatics. Go to full review. Available from Amazon.com, Midnight Special Bookstore, Seminary Co-op Bookstore, and Oxford University Press. Oxford University Press web site for Figurative Language and Thought.